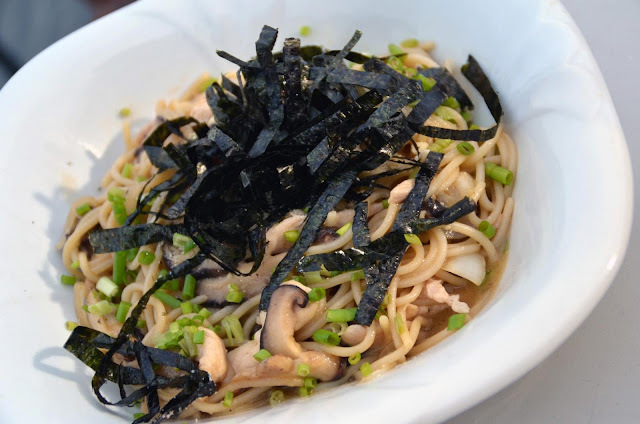 Finally, there is Japanese Pasta with Mushrooms and Chicken Soy Sauce and Butter Sauce. Yes, you cannot get enough of chicken because this Japanized pasta is a surefire winner both in taste, texture and presentation. 1. Fill large pot with salted water and bring to boil. Add spaghetti to pot. 2. In large pan over high heat, add oil, butter and garlic. Cook for 2 mins. 3. Add mushrooms and cook for 3 mins. Add shallots and cook for 2 mins. Add chicken breast slices. 4. While pasta is boiling, reserve about ½ cup of pasta water. Drain pasta and add to pan of cooked mushrooms. 5. Mix well and add soy sauce, sake and mirin. Mix well again, making sure all pasta is coated with ingredients. 6. Add good amount of fresh ground black pepper and a little bit of pasta water to make sauce thicker. Then lastly garnish with onion leeks and julienne nori. 7. Serve with parmesan cheese.